Our Hookey Ring Toss Game is for all age ranges with better performance in basic mathematics and development of hand to eye coordination with different mastery skills, easy to play in various ways without limited players. Just mount on a wall out of the weather and play with family members and it is a addictive and challenging party game, since it's ideal for a fun friendly competition. From a particular distance, the objective of the game is to throw the 6 rubber rings (one at a time) and hook them on any of the 13 numbered hooks. Then add up the number that you have ringed to calculate your score. 1. Decide the throwing order for each player. Each player takes turns throwing their 6 rings and the highest point total starts first and others follow in that order. If you are playing with 4 people, each team gets 3 rings each. 2. Create the throwing line for which you can not cross. I would suggest 6 or 9 feet away depending on the skill level of the players. 3. Each player throws all their 6 rings one after another. After this the rings that land on the hook will be counted as their score. 4. If all 6 of the rings one player throws lands on the hooks they get another bonus throw. 5. The first player to reach the 101 points and not going over wins. If you do not get the exact number and go over, then your throw does not count and will need to wait again until your turn to throw. It's a wonderfully substitution for darts, no sharp darts here, no need to worry while the kids play our ring toss game, it's easy to play but full of challenges and addictive. This is a fun family game that bring everyone together from grandparents to children play enjoy the best time with family, wonderful game for family. 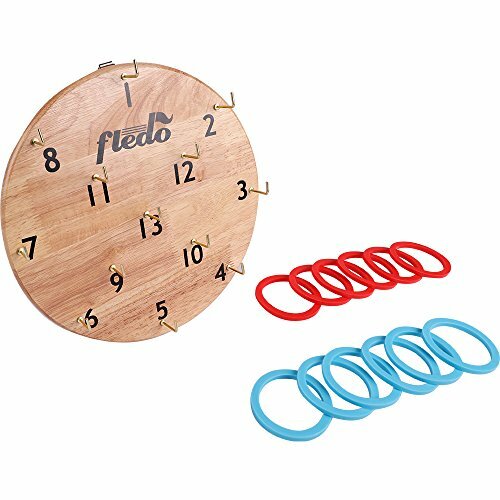 A classic toss game originated in Greece that kids can develop hand-eye coordination, fine motor and mathematical skills while having fun with our ring toss game! They need to add numbers in order to find their scores and create more playing method, that keep kids active, happy , healthy and creative. A perfect game for family. our ring toss games are simple and fun indoor outdoor games , it won't matter how good or bad the weather is, take you pick to play an indoor ,especially for the rainy days and cold winter , a wonderful gift for kids, fun boy games or boy toys, suitable for parties, barbecues, cookouts, tailgates, weddings, family reunions and more! Our game board made of beautifully crafted rubber wood, 12'' in, hang up in the wall would be a great ornament no matter in house or office, it's easy to set-up and easy to play ,the package come with 1 game board，6 red 6 blue rings 13 metal hooks and a instruction. Tossing game with safety and environment rubber rings. customer satisfaction is our number 1 priority. If you're not 100% happy with our item, please feel free to contact us.